This apartment is the ultimate way to enjoy a Pauanui breakaway. This three-bedroom suite is vast in size at 197 sqm. The master bedroom in its own wing features a king bed, large walk-in robe and ensuite with double vanity, deep bath tub and shower. Two other bedrooms with a queen and two king single beds provide plenty of comfort while a second bathroom with guest toilet, shower and vanity allows extra convenience. Another sitting room with relaxed seating provides another space to unwind away from the main living area. A large scale kitchen provides full cooking facilities and the spacious dining area is great for entertaining, or head outdoors on your choice of two balconies to use the BBQ, or enjoy the view overlooking the pool and garden. 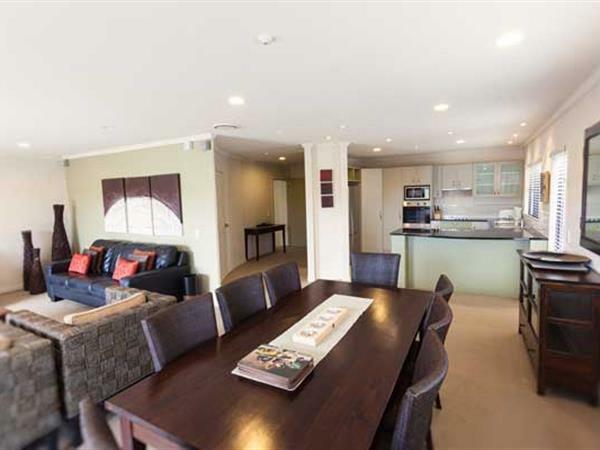 This apartment is the perfect suite to experience Pauanui and entertain family and friends.